One of the largest community gardens in Los Angeles, Ocean View Farms (OVF), celebrated its 30th anniversary today with a gala that included tours of the garden, a potluck lunch, and speeches by councilman Bill Rosendahl and others. 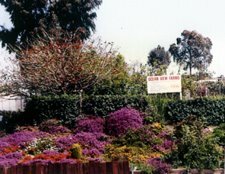 These gardens are in Mar Vista just east of Centinela Ave at Rose Ave. Each garden plot has a view of the Santa Monica Bay on a clear day. For only $30 something dollars a year, anyone can rent a garden plot. Members get access to compost and steer manure. It is perfect for people who like to garden, but live in apartments without yards. Even though I live in a house with a big yard and can have my own private garden at home, I still think it would be fun to join OVF and be part of the gardening community. I think it would be a nice thing to share with friends. It would be a place to meet on the weekends and spend some time outside. The only problem is that I don't have any friends that like to garden. Someday if I ever make any friends that live nearby and like to garden, I will propose that we sign up for a plot at OVF together.